Note: This feature hasn't been released yet. This article discusses how it should work after it's released. 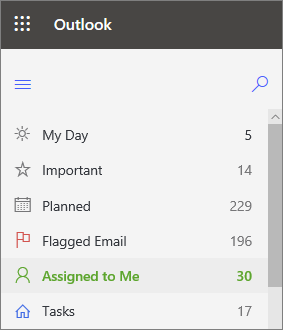 You can get your group tasks done at the same time as your individual tasks using the Assigned to Me list in Tasks for Outlook, powered by Microsoft To-Do. Assigned to Me shows you all of the Planner tasks that appear in the My Tasks view. You can find Assigned to Me in Outlook for the web, or in the To-Do app. Go to Outlook for the web and select Tasks at the bottom of the navigation pane. Note: If you see a different Tasks icon than , you're using the classic Tasks in Outlook on the web, which is not powered by Microsoft To-Do. For more information, see Use Tasks in Outlook on the web. In Tasks, you should see the Assigned to Me dialog box in the bottom left of your window. To see your Planner tasks, choose Show list. In Tasks, in the upper right corner, choose Settings. Under Outlook, select To-Do Settings. Scroll down to the Connections section and, under Tasks from Planner, either toggle the slider to On or Off. To change anything else about your Planner task, you can open the task directly in Planner by selecting Planner under the due date.